Overview: BalanceFrom balance beams are an excellent development aid that can greatly benefit young gymnasts, martial artists, cheerleaders, and even special needs students. BalanceFrom balance beam is constructed with high quality wood core. 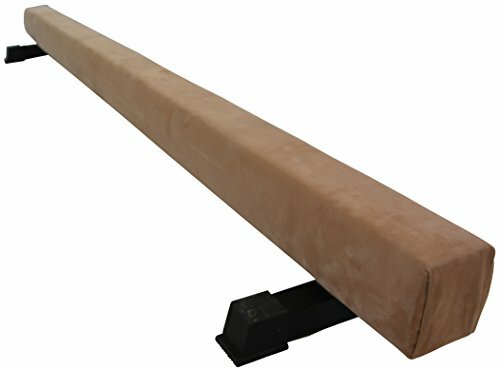 Wood core is wrapped by 3/8″ padding then covered by high grade synthetic suede. The balance beam has flat top and bottom, but round competition shapped side. Comes with two 12′ long legs to provide a low profile to the balance beam. Super easy to assemble with simplized design. 250lb Weight Limit. Meet CPSIA requirements. Convenient and safe to pratice at home or gymnastics room. Dimensions: The beam measure 8 feet long, 7 inch high with legs (5.2 inch for beam + 1.8 inch for leg). 4 inch work surface. Each leg measures 12″ x 1.8″ (each leg has tow non-slip end caps).